The dust has barely settled on Cassadee Pope's big win on "The Voice" last month, but with big changes in store for the show's fourth season -- most notably the addition of two new coaches -- it's never too early to look ahead. Billboard recently attended a press conference with those newbies, Usher and Shakira, as well as mainstays Blake Shelton and Adam Levine. 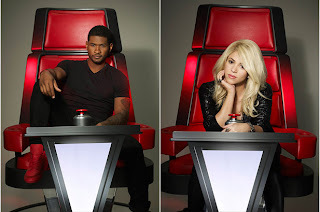 Shelton noted that with the departure of Christina Aguilera and Cee Lo Green, the dynamic has "definitely changed" and that throwing Usher and Shakira into the mix has fostered an added competitiveness to the NBC show, which comes back on March 25. "Cee Lo was always so laid back," Shelton added. "He's kind of been the quiet killer in this thing. We replace Cee Lo with somebody that's just that more aggressive and now you've got four that are killers up here." Added Levine, "Now you have a pregnant, hormonal Colombian. She's ready to bust some heads. She ain't messing around!" Skakira admits that recruiting for her "Voice" team has certainly lit the competitive fire in her. "Once we are in the process of trying to get a contestant recruited for our team, there's a lot of adrenaline and there's a lot of tension." She also mentioned her tendency to micro manage her career, which she says carries over to her mentoring. "When I'm giving directions to my contestants, I'm particularly focused on details." Usher described Shakira as a mix of "comic relief, super f-cking serious, and gangster," explaining that "she's so nice now but she really pulls out that switchblade in the battle." He also revealed that his own coaching style is fairly serious. "My style is more military than anything because I'm all about the preparation. My style is to make them understand the seriousness of the craft and that they have the very best opportunity to be the greatest -- or the worst -- depending on how you take it." Levine explained that Season 4's new coaches have already figured out how to leverage their strengths. Shakira plays the female card a lot -- "That's one thing we can't compete with really so she's smart" - and Usher likes to remind his fellow coaches of his success with Justin Bieber. "As much as I hate to say this about another coach in the beginning, Usher has done what this show has yet to do - launch a superstar and that's our goal. That's something we want to do as an institution." As the conference wrapped, Shelton agreed with Levine, and Shakira looked to Usher and playfully said, "We all want to be like you when we grow up." While we'll undoubtedly miss Aguilera's outfits and Cee Lo's eccentricities on "The Voice," the new season looks to be chock-full of entertainment. Season 4 of "The Voice" premieres on NBC on March 25.